Knives are an integral part of the kitchen for both regular households and commercial food establishments such as restaurants and meat vendors. Ready to use knives are invaluable aids to your cooking process because they affect the speed and ease of food prep. I have taken it upon myself to highlight some of the best and most effective knife sharpeners in the market today. They include inexpensive manual options that are a great option as well as automated and more sophisticated ones with stunning technology and phenomenal results. Below is a comparison of these knife sharpeners in a chart before I review them in detail. The need for a knife sharpener in your kitchen may be overlooked temporarily but the end result is knives that get dulled over time. 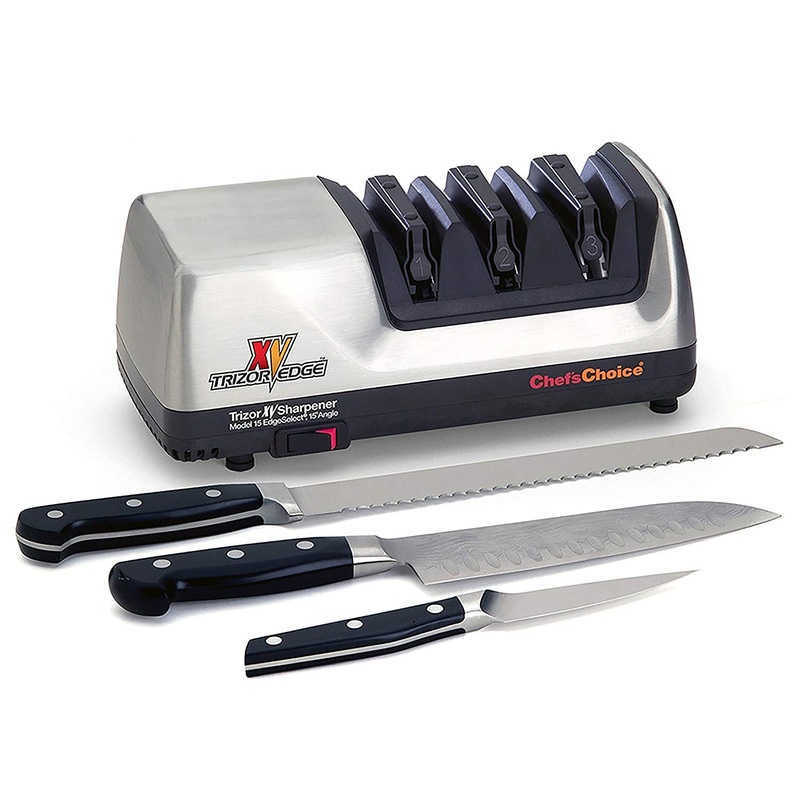 But if you are equipped with Chef’schoice Trizor XV, your knives becoming dull will be the least of your worries. Sharpening knives becomes effortless and the technology in this electrical unit helps your knife stay sharper for longer. 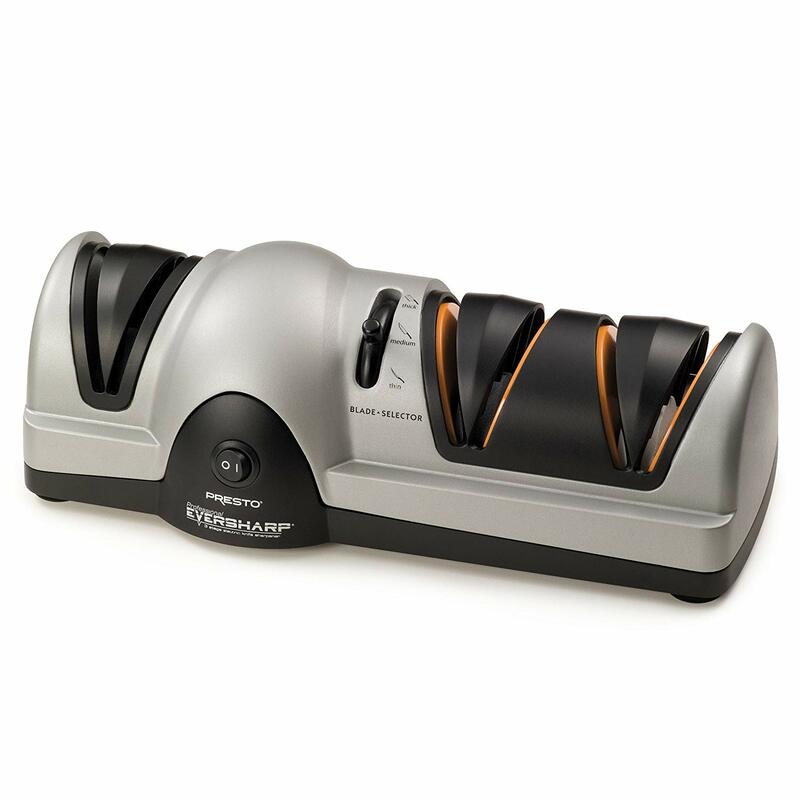 The Trizor XV is engineered by the reputable Edgecraft corporation that was established in 1985 with the sole purpose of creating high quality knife sharpeners. The brand crafts both manual and electrical knife sharpeners with impeccable quality. The Trizor XV is one fine example of their handy work. Traditionally, most knives come with a 20 degree bevel edge from the factory. Chef’s choice is the ideal knife sharpener for converting a traditional 20 degree angle household knife to flawless ultra-sharp 15 degrees high performance Trizor XV edges. What difference does the angle on a knife make you might ask? Well, the answer is; A lot of difference! A 15 degree Class knife will cut and slice more easily in addition to dulling slower compared to a 20 degree class knife. When it comes to knives, chef’s choice understands that the thinner the knife’s edge, the easier it is to both control and cut. The 1st and 2nd stage sees to it that proper sharpening and honing are done utilizing conical rotating discs plated with 100% diamond abrasives. The 3rd stage comprises of a flexible conical rotating disc which ensures the blade is polished through a stropping action with minimal metal removal. This is an important point to note as it means your knife will serve you longer. This sharpening unit has a great look and is not only a great aid in your kitchen but adds a nice touch of aesthetics to your kitchen counter. It is quite hard to find a unit that works so softly yet is so effectively abrasive. Now you know why, this unit is the chef’s choice and that is why it comes highly recommended. This manual knife sharpener can have you fooled because of its size and you may second guess its worth on your kitchen counter. The second reason that may cause you to overlook it is the very low price it retails at. 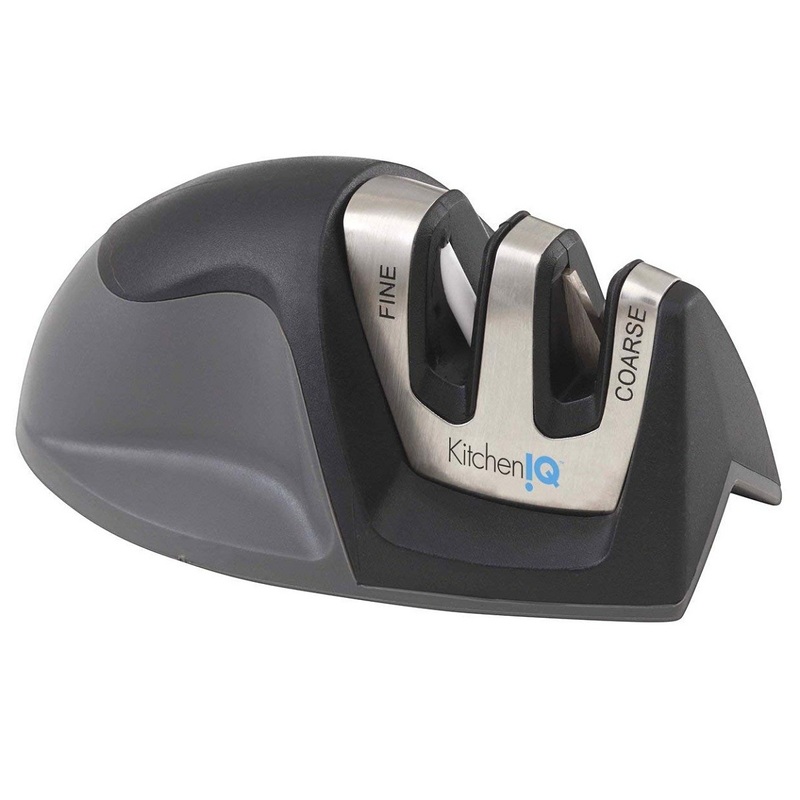 Interestingly, the Kitchen IQ Edge Grip 2 Stage Knife Sharpener is worth considering for exactly the same two reasons mentioned above: size and price. What sets it apart in the race for knife sharpeners is both its build and cost. This practical unit is designed and constructed by Smith’s Consumer products, Inc. a company renowned for creation of expert edges since 1886.The edge grip makes it so easy to use so the manual aspect should not be daunting for anyone in the kitchen. In fact it’s almost effortless because all that is required of you is to simply hold the ergonomic handle and swipe your knife through either of the two slots several times beginning from the hilt and pull. The slots are angled at 20-22 degrees which is perfect for most knives as this seems to be the default factory angle. The Edge Grip 2 has a two stage sharpening system, coarse and fine. For best results, use the coarse slot which is made for blunt and dull knives at first. A few pulls and you will be pleasantly surprised to see them sharp as a razor. Then pass them through the fine tile slot that will give them a softer and sharper finish. Knives that are fairly sharp can be passed through the fine slot which is made of fine- grit ceramic just for a re-touch to make sure they stay in tip top shape and on the ready whenever you need them. This unit features the ‘edge grip’ which is unique because it allows you to sharpen both small and longer knives. Longer knives have a tendency to drag on the counter top as you attempt to sharpen and can easily get damaged or worse, damage your precious granite or wooden counter top. The ‘edge grip’ feature prevents this possibility as the design of this unit allows you to place it on the edge of a work top thus availing more room and flexibility to work with when sharpening. You can comfortably use this manual sharpener on top of a work surface to sharpen most knives and the additional flexibility is a welcome thought when you need to sharpen large knives. Its portability is simply remarkable as you can take it with you and use it anywhere from a yacht to a camping trip or a mountain hike. Storage in your kitchen is a breeze with the Edge Grip 2, as it can fit in with the knives in the same drawer. Very effective two stage system, coarse slot made of carbide and a fine slot made of ceramic. Given the simplicity, stability and sturdy build of this unit not to mention how effective at sharpening it actually is, the price is definitely worth it. The portability adds to the convenience as it can be used both indoors and outdoors and it does not require electricity. In fact some would argue that this option is ideal for them and a preferred choice to stone, steel and electrical options owing to how hassle-free it is for such a price tag. Definitely the best bang for your buck. During a cooking session the last thing you want is wasting time with a dull knife. You can ensure this does not happen by having an ‘A’ class knife sharpener handy in your kitchen. In my experience presto is an electrical professional knife sharpener that does not disappoint. It has the sophistication to sharpen a good range of knives from standard kitchen knives or sporting knives to santoku knives. This is made possible by its special ability to provide optimal sharpening angles. By selecting thick settings, you can sharpen your hunting knives to perfection while chef’s and standard kitchen knives are sorted out by the medium selection setting. Light blades such as paring knives and blades for gutting fish will work well with the fine option. The machine is fairly sized and it can snugly fill a shoes box. The sharpening operation is fairly easy as all that is required is simply to draw the knife through each slot several times and your knife’s edge will be sharpened just the way you like it. This electric unit is easy to operate as it utilizes a three stage sharpening system. When starting to sharpen dull knives, you want to use the selector to choose a preference from thick, medium and fine depending on the type of knife that you are sharpening. Once that is done, you would proceed to start the sharpening process with a coarse grinding wheel. This is made of saphirite and helps create the proper angle. The 2nd stage involves moving on to a medium grinding wheel to give precision. The 3rd and last stage is sharpening on the fine slot. This sharpens your knife to perfection with an ultra-fine-grit ceramic wheel that sees to it that your blade is polished to an exact, razor sharp edge. Drawing the knife through the respective slots a few times ensures that you have you knives sharp with almost no effort and without losing time. This is a solid knife sharpening unit with a unique feature of adjustable angles that allows sharpening different type of knives with ease. Being an electrical sharpener, there is barely any effort needed other than sliding the knife through the given slots a few times. No doubt that this unit is value for money. It is somewhat longer and would require a counter top that has ample space. Simple does it! is written all over the design and mechanism of this manual knife sharpener. What I liked is the simplicity and practicality of the design while still managing to inject some sense of class. 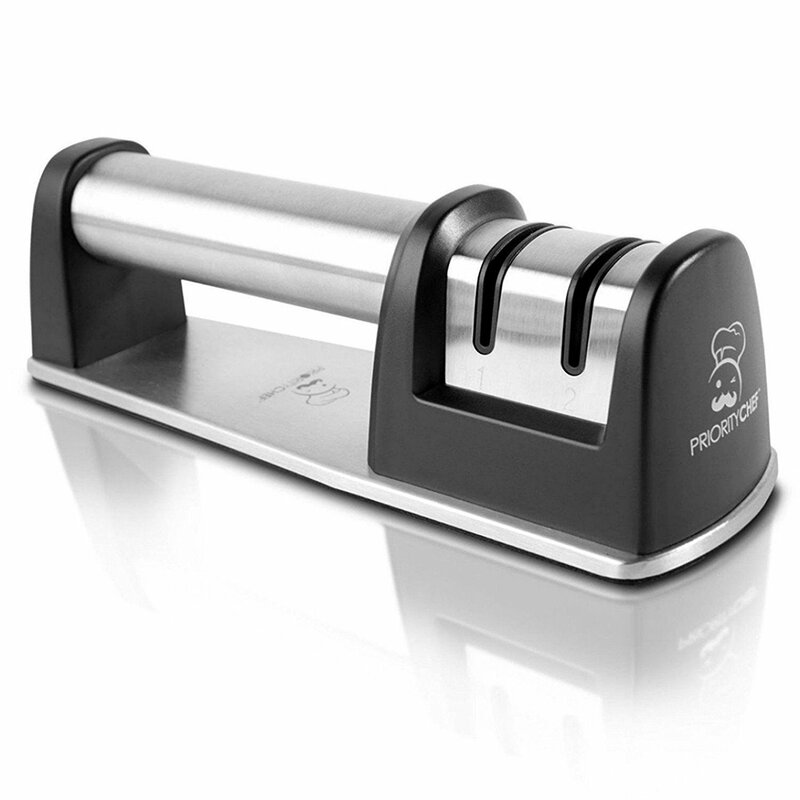 The priority chef knife sharpener stands out in your kitchen and is very portable. The stainless steel finish with a black frame and straight edges exudes a classy look and speaks of durability. The bottom has rubber to avoid any slippage or marks on your kitchen counter. This also makes it is safe when pulling your knife through the slots. Operation is very easy and can be used by anyone in the house as it does not require muscle or skill. The unit uses a two stage sharpening system and comprises of two sharpening slots made from the finest material possible. For absolute dull knives, the first stage has to be through the coarse slot that works on a diamond wheel system. Diamond is one of the hardest substances on the face of the earth and ideal for sharpening. By pulling even the dullest of knives through this slot, the diamond wheel sees to it that an angle is formed on both sides a knife’s bevel edge. The 2nd and last stage is pulling the knife through the fine slot that is made of a fine-grit ceramic wheel system. This section hones and repairs any nicks on your knife’s edge as it polishes to the perfect sharpness. If your knife has gone dull, you can also opt to use the ceramic wheel slot directly to quickly bring it back to form. If it is very dull, then it is better to start with the coarse diamond wheel slot then fine tune on the ceramic slot for super sharpness. This manual unit can also sharpen serrated knives by using the ceramic wheel slot. I liked the design, size and simplicity and the fact that this does not compromise ease and quality of sharpening. The price of the priority chef is a bargain for such value. For Euro-American and Asian knives, the Chef’s choice ProntoPro is the sharpening master. The design is well thought out with both utility and aesthetics in mind. The exterior is steel with a rubber frame. The handle is uniquely designed to have an easy but firm non slip grip, while adding some sense of style to the unit. The sharpening mechanism of this unit is in three stages and has the ability to sharpen knives of both the 15 and 20 degree class. These three features work in tandem to deliver outstanding sharpening results that are sharper and last longer. The sharpening slots contain 100% diamond abrasives. The 1st and 2nd stage sharpens and hones the blade. The third slot has micron sized diamond abrasives that are responsible for polishing the bevel edge to astute sharpness. By simply pulling the knife through respective slots several times, your knife gets sharpened to your desired sharpness. The design is very pleasing to the eye and I actually like how it looks on my kitchen counter for all to behold. All slots have diamond wheel abrasives so you can be sure effective sharpening and durability form the chef’s choice ProntoPro. 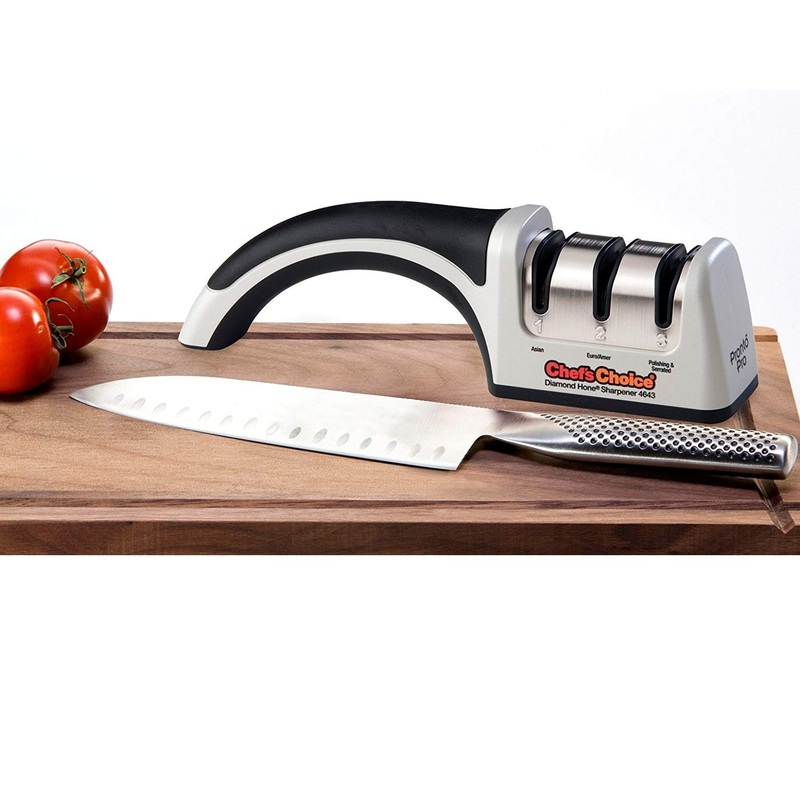 Knife sharpeners both manual and electrical utilize latest and proven sharpening materials and technology to make knife sharpening one of the easiest task in the kitchen today. This list in not exhaustive but it does capture some of the most effective and popular knife sharpening materials you can expect to see in knife sharpeners today. What type of knives do you have? Standard utility kitchen knives can be sharpened by most knife sharpeners. What if you have specialized knives such as sports and hunting knives? In this case you want to carefully consider the knife class angle and length in order to choose an appropriate knife sharpener that will not damage your knives. 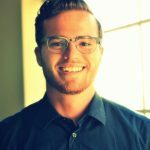 Is the knife sharpener durable? The life of knife sharpener is largely determined by the material used in the sharpening slots. The list above highlights some of the most effective and durable materials to look out for. What is the bevel angle of your knife? Most knives seem to have a default angle of 20-22 degrees from the factory. Knife sharpeners will either be for 15 or 20 degrees class knives, however, some knife sharpener will accommodate both class knives. Can any of the above mentioned knife sharpeners sharpen scissors? What knife sharpener is ideal if you have different types of blades including serrated? One with a blade selector would be most ideal as it can work with different angles from thick, medium to thin. What is the best option manual or electric? This based entirely on preference and the type of knives you have in our kitchen. Knives are an integral part of the kitchen and it is absolutely understandable that cooking aficionados can have quite a collection in their kitchens. No matter how simple or elaborate your knives might be, the above options provide a broad range of sharpening machines of varied sophistication from manual and simple to electrical and sophisticated. This makes your job in the kitchen, all the more easier and all your knives can now stay in tip top shape ready for use at a moment’s notice. Happy sharpening and may all you meals be delicious!